Many mobs will be a little shocked by your presence, so be prepared for the fact that from the strongest will have to fight back all the time- The Cyclops Skin! It would also be nice to add a couple of new cards and test this skin on them and thereby learn more cubic reality. Your new hero can spawn in different ways. But definitely not friendly. Because Cyclops have long been known as one-eyed monsters. Even in ancient Greek mythology, various legends and stories have already spoken and told about them. If you are not afraid that they will attack you, or you are able to adequately respond to your future offenders, then of course, hurry to download the new product to your mobile device. What does the Cyclops skin look like? This is the skin of the real monster. Green and brown stripes, and even with numerous features of the body. But the main horror film is one eye! Seeing such a monster just once on the way, you immediately realize how difficult it can be to fight it. But in reality, it all depends on the skills of its owner. After all, it’s just a skin! For multi-user servers, this image is just a godsend. With it, you can go to explore almost any location, any biome and not be afraid of being eaten or killed in the first minute of being in an unfamiliar area. Even creepers may be afraid of such a cyclops. You check on your own experience what to do in such situations and how to save yourself if something happens. 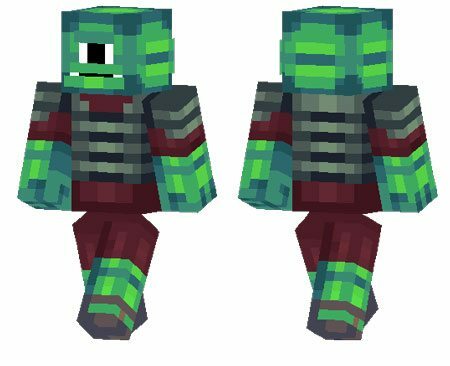 Cyclops Skin Skin 1.2.10 is already available on our website, it remains only to download it in the game client of the MCPE of your device.